Cardiff Castle is a medieval castle built in the late 11th century by Norman invaders on top of a 3rd-century Roman fort. The castle was commissioned either by William the Conqueror or by Robert Fitzhamon, and formed the heart of the medieval town of Cardiff and the Marcher Lord territory of Glamorgan. In the 12th century the castle began to be rebuilt in stone, probably by Robert of Gloucester, with a shell keep and substantial defensive walls being erected. 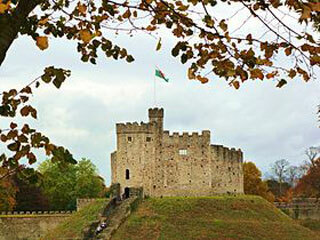 Cardiff Castle was repeatedly involved in the conflicts between the Anglo-Normans and the Welsh, being attacked several times in the 12th century, and stormed in 1404 during the revolt of Owain Glyndwr. This article uses material from the Wikipedia article "Cardiff Castle", which is released under the Creative Commons Attribution-Share-Alike 3.0 License.